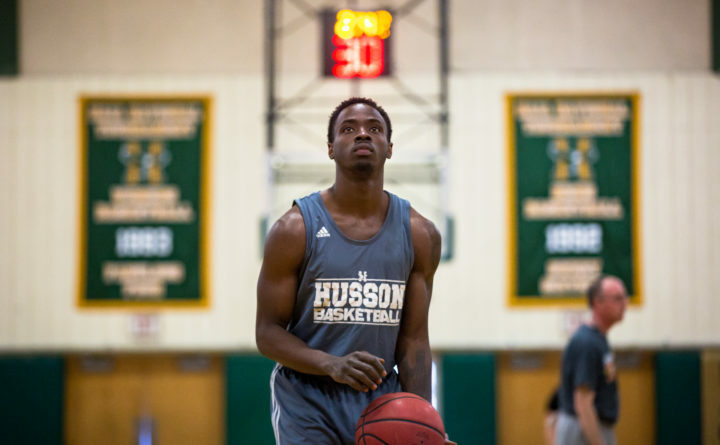 Husson University's Raheem Anderson practices at Newman Gym in Bangor in February 2017. BANGOR, Maine — The Husson University men’s basketball program will honor its 1,000-point career scorers during halftime of its game against Pine Manor on Saturday at Newman Gym. A total of 49 players have scored 1,000 or more points in the Husson men’s program, topped by Ray Alley’s 2,657 from 1991-94. Former Bangor High player, Bob Cimbollek, who went on to high school coaching career after Husson, was the first 1,000-point scorer at Husson, totaling 1,152 points from 1956 to 1958. Saturday’s game tips off at 2 p.m. and some of the players expected to attend are Mike McCaffrey (Class of 1999), Steve Levasseur (1984), Phil White (2002), Bobby Campbell (1990), Randy Wadleigh (1987), Rich Mazurek (1994), Buddy Leavitt (2007), Ish McKitchen (1976), Cimbollek, Brady Olson (2000), Jason Harvey (2007), Kevin Saunders (1978), Sean Foye (1999), Rick Sinclair (1997), Robert Pilsbury (2003), Tom Philbrick (1978), Matt MacKenzie (2010), Raheem Anderson (2018) and Trevon Butler (2016). The 24th annual Maine Soccer Coaches Senior Bowl all-star games will take place Sunday at Thomas College in Waterville. Players from this year’s senior class who have been selected to a Maine Soccer Coaches Association regional all-star team are eligible to participate in one of these contests. The four-game day pitting North teams against South representatives begins at noon on the Black Field at Thomas College with the Classes A-B boys game, followed at 12:15 p.m. by the Classes C-D boys contest on the Red Field. The girls doubleheader will follow, with the Classes A-B matchup at 2:30 p.m. on the Black Field and the Classes C-D game at 2:45 p.m. on the Red Field. The 45th Maine Soccer Coaches all-star banquet will be held at the Spectacular Event Center in Bangor at 1 p.m. on Sunday, Dec. 2. BOSTON — The World Series champion Red Sox completed their tour of the three other major Boston-area professional sports teams Monday night, bringing their recently captured trophy to a Bruins game. Owner John Henry, president Sam Kennedy and pitcher Joe Kelly were on hand for a ceremonial faceoff between the Bruins and Dallas Stars. Kelly dropped the puck between Bruins’ captain Zdeno Chara and Stars’ captain Jamie Benn. Each of the Red Sox members got a Bruins’ jersey with red numbers and their last name stitched on the back. Henry’s was “18” for the year they won the title. They brought the trophy to a Celtics game last Thursday and Sunday’s Patriots-Green Bay Packers game in Foxborough, Massachusetts. The Red Sox closed out the World Series on Oct. 28, beating the Los Angeles Dodgers in five games. CARLSBAD, Calif. — Houston Astros right-hander Lance McCullers Jr. will miss all of next season following Tommy John surgery. Houston announced McCullers had the ulnar collateral ligament in his right elbow repaired Tuesday. The 25-year-old was 10-6 with a 3.86 ERA in 22 starts and three relief appearances this year, striking out 142 in 128 1/3 innings. He was 10-4 before the All-Star break, then went on the disabled list from Aug. 5 to Sept. 24 because of elbow discomfort. McCullers returned for the final week of the regular season and had three scoreless relief appearances, then had a 1.80 ERA in five relief outings during the playoffs. He is 29-22 with a 3.67 ERA in 80 starts and three relief appearances over four seasons and was an AL All-Star in 2017. PITTSBURGH — Pittsburgh Steelers quarterback Ben Roethlisberger sat out practice on Tuesday to give his broken left index finger a rest but he is expected to play on Thursday night when Carolina visits Heinz Field. Roethlisberger said the finger was “fine” after he threw the ball 47 times in last Sunday’s victory over Baltimore. The Steelers (5-2-1) have ripped off four straight wins to climb into first in the AFC North. The short week means they won’t have much time to prepare for the surging Panthers (6-2), which might not be a bad thing. Roethlisberger expects to rely a little more heavily on the no-huddle offense, a setup in which he thrives. The Steelers often turn to the no-huddle in an effort to snap them out of a funk early in games, but Roethlisberger isn’t using it as a method of trying to get the ball downfield. While he’s on track to set a career high in yards, his production has dipped a bit during Pittsburgh’s winning streak. He’s gone over 300 yards just once in Pittsburgh’s past five games after going over 330 yards in each of the first three weeks. An improved defense has helped. Roethlisberger lit up scoreboards early because the Steelers were trying to keep up with opponents who had little trouble getting to the end zone.